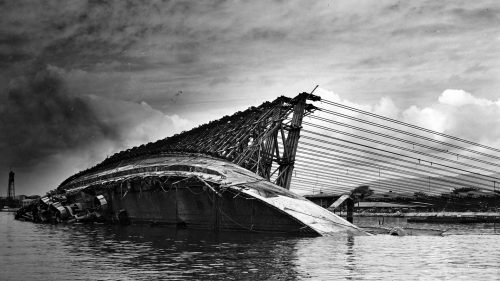 Salvage operations, USS Oklahoma (BB-37), sunk during the Pearl Harbor attack. Looking forward on the offshore side of the capsized battleship, at the 109° position. Wow. Didn’t know they’d done that. In my lifetime, there have been few things I’ve experienced that were more emotional than standing on the Pearl Harbor memorial, looking down at the USS Arizona, knowing that there remains over 1,100 men who are resting in the hull of that sunken ship. If you are ever in Hawaii, make the effort to visit Pearl Harbor. You will not regret it. You are probably right. I didn’t regret visiting Auschwitz, despite what might be described by snowflakes as trauma. (Just made me agree with “Never Again”.